AG: Bartelomeo Vanzetti – has anybody read..ever heard (of) him? – Bartelomo Vanzetti? 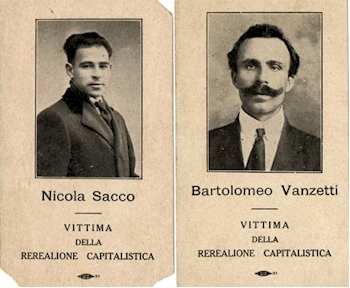 Sacco and Vanzetti? Has anybody notheard of Sacco and Vanzetti? Did you hear of Sacco and Vanzetti? – ok, they were a bunch of anarchists (like Jerry Rubin and Abbie Hoffman, except..
Student: Except they went deeper..
AG: ..they were Italian fish-peddlers (except they were sort of cultural heroes of their day). – What’s the story do you remember? Student: They were accused of anarchist bombing in a… I don’t even know if the bombs went off, but they became symbols, and there’s a lot of evidence that they were actually innocent. They were put on a show-trial. The entire international Communist world rallied to their defense. They were..
AG: [to Nina Zivancevic] [this is 1981]: They’re famous in Yugoslavia! Student: ..total examples of the American working-guys, solid Communist man..
Student:..that gets nailed and ..
Student: Yes, it’s very moving. I mean…he wrote moving stuff. AG: A fish-peddler, who read books in Italian, and knew..had come from Italy and could speak English, just about (both of them), worked together, knew each other, around Boston, and had an anarchist circle. And so it was assumed they were framed for some kind of anarchist bombing..during a period of early McCarthy-ism, 1927..
Student: Robbing a bank, right? AG: Robbing a bank, killing someone and robbing a bank, wasn’t it? AG: Bombing a bank ..for anarchist reasons..
Student: I don’t think… did the bombs ever go off though..? Student 2: The bombs went off. I think they killed somebody. Student 2: Well, because, yeah, because the sentences were more severe weren’t they? – Didn’t one of them get the execution..electric chair, so..
Student 2: They both did. So they must have killed someone in this bombing ..
Student: There was a bombing but there’s no proof , if I read the history, that connected them to the bombing. And that’s why it was.. because they, philosophically, believed in it, and wrote about it, or spoke about it, anyway – but there’s no hard evidence that they did it. but I even forget to name Sacco. at the verge of a wood, near a brook. a man, lover of nature, and mankind. Sacco has never dreamt to steal, never to assassinate. which has not been gained by the sweat of our brows. this man called thief and assassin and doomed. talking at street corners to scorning men. I might have died, unmarked, unknown, a failure. Now we are not a failure. of man, as now we do by accident. Our words, our lives, our pains – nothing! Thank you for this moving tribute to two very likely innocent men. The words of Vanzetti themselves plead for their heroism, whatever the reality of their actions. It takes dedication to a cause greater than the men as individuals to think like this.